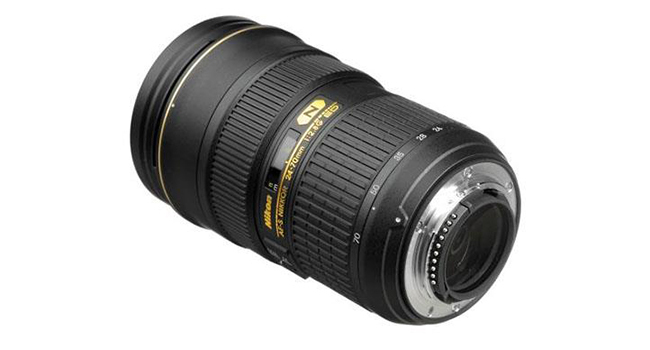 Nikon’s AF-S 24-70mm f/2.8 was released in August 2007 – a fantastic, high-quality workhorse lens, covering the most common zoom range for everyday needs. It’s happy on any Nikon FX (full-frame) and DX (APS-C) DSLRs, with the focal length being 36-105mm on crop sensors. The lens benefits from 15 elements in 11 groups, three ED (extra low-dispersion) elements, three aspherical elements, and a Nano Crystal Coating. All top quality variables for use on a daily basis. Being a mid-range zoom, this is the type of lens that you would use every day. Therefore, you want something that is solidly built and sharp across its range. The aperture range goes from f/2.8 – f/22, with a minimum focus of 1.2 feet/0.38 m. The motor is the fast and accurate ultrasonic on all Nikon cameras and weighs in at a solid 900g, heavy but reliably so. It has a rotary extending zoom action, allowing for easy manual focusing and a 77mm filter thread. It’s definitely a hefty beast that makes you feel you have something of quality in your hand. The lens also comes with an HB-40 plastic bayonet hood. You also get a rather nice Nikon CL-M3 padded nylon case with a belt loop for swapping out lenses on the fly, if needed. The manual focus button (M/A – M switch) can be flicked very easily meaning that it is very easy to zoom and shoot throughout the focus range one-handed. Very useful in the field. This really just deactivates the autofocus. In the M/A position you only need to move the manual focus ring if you so desire, with ‘M’ holding your manual focus position to where you set the ring. Everything here is very easy and straightforward to use. The last iteration of the 28-70mm f/2.8 AF has no switches but does have a zoom ring. It is also a big, bulky affair, with the AFS motors being just as huge. As a comparison, this lens can focus a little bit closer than the older model at 0.38m vs 0.5m and with a wider angle 24mm vs 28mm. This means that the new model is 11mm longer and weighs just a bit more 0.560 oz or 5.85g in new money. When zooming in and out throughout its range the lens doesn’t rotate. The front of the lens extends 4 mm at the 70mm end of the range and 20 mm at the 24 mm length. The lens does have a plastic filter ring which means without a filter attached, you have to make sure you don’t bang this against any hard surfaces. Everything on this lens is simple and straightforward, making it as plug and play as possible. The lens has immediately apparent sharpness even when wide open at f/2.8, but like any zoom, it’s definitely worth stopping down if you want everything pin sharp. Completely wide open at f/2.8 shows little sign of darkening in the corners when used on a full frame sensor, admittedly sharper than I would have expected. Like the equivalent lens from Canon, it’s not the greatest close-up, but in reality, if your subject matter is macro, then you’ll probably opt for a more specialized lens. It may also lack VR (vibration reduction), but the added benefit of f/2.8 for most people using this type of lens for action, VR may not be as missed as you may think. At its closest focus range, the images are reasonably sharp if you are at F8 or above. Pretty good for general use, but it wouldn’t be something you would use of a regular basis for macro shots. The lens is consistent across the range, which you need for an everyday zoom. There is some distortion especially when wide open, but this can be easily corrected in post-editing. On a full frame body, there is some vignetting, especially wide open. This is not so bad on a DX camera. The center sharpness is greater across the lens range at nearly every focal length. It may start to get a little soft at f/11 or above if you factor in diffraction, but you really have to be blowing up your images to a large size to see the difference. At 24mm the corners are still sharp, but can get a little soft at f/2.8. Wind it up to f/75.6 and above and things are great. At 70mm there are no complaints. Obviously, you’re going to get better clarity using a bunch of prime lenses, but as an everyday, all-rounder most err on convenience and quickness factor when out in the field, especially if you’re shooting any type of action shots. This is where a consistent zoom lens with the benefit of f/2.8 comes into play very nicely. If you get some auto focusing problems especially wide open you may need to dive into the AF Fine Tune menu option and calibrate your lens to your camera body. There are plenty of tutorial videos online showing you how to do this process or you can plump for some automated software like Focal. Currently, there may be an up-to-date lens in the 2015 24-70mm f/2.8 VR (vibration reduction), but this version is still a great performer, weighing and costing less than its newer version. In many ways, this lens works best and gets its full benefit on a full frame body, but it will work just as well on any DX camera. The lens is solid and feels a quality item reflected in its images. This is a fantastic mid-range zoom which will cover your daily needs with fantastic image quality. It can be a little soft at the edges wide open especially on a full frame body, but this can be easily rectified in post processing. It does work the best on FX cameras, being quite a heavyweight on a DX. However, you shouldn’t discount it on a DX camera as the quality is excellent and worth the price.